In light of the regular attacks on teachers unions, I thought a “The Best…” list highlighting their benefits would be useful. heart-wrenching film Waiting for Superman. as they try to escape from unionized teachers who are, in fact, zombies and vampires. I’m very interested in hearing suggestions about additional articles I should include. Rethinking Schools has a number of related articles and resources. Teachers Unions, ACT/SAT, and Student Performance: Is Wisconsin Out-Ranking the Non-Union States? is a very important post by Angus Johnston. He examines the research connecting the role of teachers unions to student achievement. There’s only been one scholarly effort to tackle this problem that I’m aware of. Back in 2000, three professors writing in the Harvard Educational Review did a statistical analysis of state SAT/ACT scores, controlling for factors like race, median income, and parental education. They found that the presence of teachers unions in a state did have a measurable and significant correlation with increased test scores — that going to school in a union state would, for instance, raise average SATs by about 50 points. Two other findings leap out from the Harvard Educational Review study. First, they concluded that Southern states’ poor academic performance could be explained almost entirely by that region’s lack of unionization, even when you didn’t take socioeconomic differences into account. Teachers, Their Unions and the American Education Reform Agenda is a report issued by National Center on Education and the Economy. Even with all of its faults, I’m sticking with the union is by Peter Schrag. Scapegoating is by Richard Kahlenberg. Unions pivotal to U.S. future is from The Sacramento Bee and has a nice section in it about teacher unions. Why I Support the Teachers Unions is by E.D. Kain at Forbes. Unions and the Public Interest is by Richard D. Kahlenberg. Bipartisan, But Unfounded: The Assault On Teachers’ Unions is by Richard Kahlenberg. Blame It All On Teachers Unions is by Walt Gardner at Education Week. Unions and the Concept of ‘Adult Interests’ is from Ed Week. Why public education needs teachers unions is by Gary Ravini. This is not good news: Fewer than half of teachers now covered by unions is from USA Today. The End of Public-Employee Unions? is from The Atlantic. Activists look to courts to weaken grip of California teachers union is from The Sacramento Bee. What AFT members need to know about the ‘Friedrichs’ case is from The American Federation of Teachers. 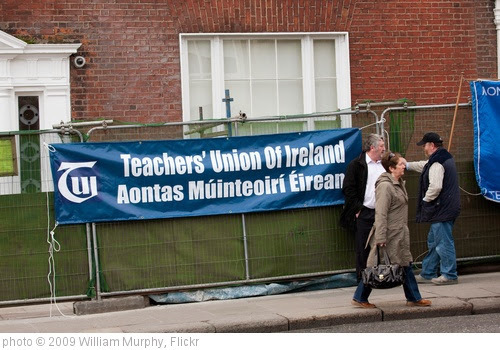 The data confirms that, compared to districts with weak unionism, districts with strong unionism dismiss more low-quality teachers and retain more high-quality teachers. The empirical analysis shows that this dynamic of teacher turnover in highly unionized districts raises average teacher quality and improves student achievement. ‘The idea that strong teacher unions impede education quality is ludicrous’ is from TES. Teacher Unions Are ‘Bargaining for the Common Good’ is from The American Prospect. What If Everything You Thought You Knew About Teachers Unions Turned Out to be Wrong? is from EdShyster. Teachers’ unions and school performance: Evidence from California charter schools is a new study showing that student achievement increased in charter schools after they unionized. Chalkbeat has an article about the study. Dynamic Teacher Unions are the key to Assuring a World Class Education’ is the headline of a two-part series in my Education Week Teacher column. Can Weak Unions Get Teachers More Money? is from The NY Times. What Do Teachers Think About How Teachers’ Unions Affect Schools? is from The Shanker Blog. I work in Adult Education and we don’t have a union. Here’s the short list: no health insurance, 6-24 hours of part-time work per week, no paid holidays, no summer pay, very little retirement. We are freeway flyers with two and three jobs. I like teaching ESL, but it wasn’t a wise choice. I work hard to augment my pay, but really it’s not worth it from a financial point. The students are great!!! I love teaching adults, but its getting hard to stay in the field. I’m totally pro-union!